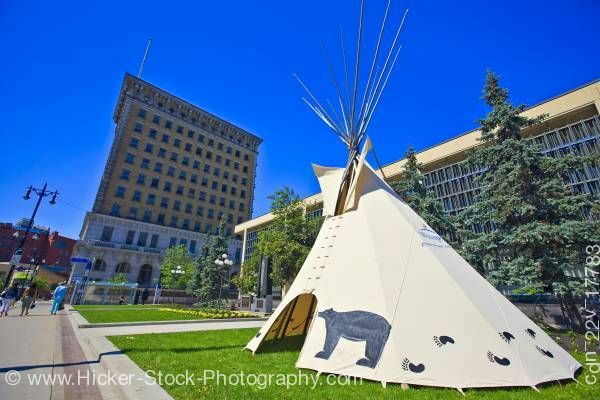 Stock photo of tee pee in front of city hall, City of Winnipeg, Manitoba, Canada. This stock photo shows a tee pee outside of city hall. To the right of the photo is a tee pee is large light tan colored cone shaped tent with with artwork a bear and paw prints along the bottom of the tee pee. The tent is supported with long wood poles. It has an upside u-shaped opening to enter the tee pee. The tee pee is sitting on the beautifully landscaped lawn along with evergreen trees that stand tall in front of the city hall building. The lawn also has to the left of the tee pee a rectangular section with yellow flowered plants and two six rounded glass and wrought iron lamp posts. To the left of the photo are people walking. In the background is a several story building, beautifully detailed with the first story showing arched entryways. Further in the background is a red bricked building. All under a bright blue cloudless sky. Tee pee set up outside the City Hall as part of the National Aboriginal Day celebrations, City of Winnipeg, Manitoba, Canada.